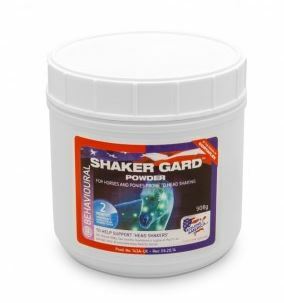 Equine America Shaker Gard Powder is a formulation of anti-oxidants and minerals, to help support the delicate nerves in your horse’s head and nose. It contains Magnesium, Magnesium, Methionine, Zinc & Vitamin B. 500kg horse- Give 28g for 30 days in your horses feed. Thereafter, feed 14g daily for maintenance.